Ogden on Politics: What Happened to Democrats Standing Up for Civil Liberties? What Happened to Democrats Standing Up for Civil Liberties? In the previous post, I commented on Marion County Prosecutor Terry Curry's letter to the editor in support of civil forfeiture. Curry: 1) supports a law that allows people to have their property taken away without being so much as charged with a crime; 2) supports law enforcement officials pocketing 100% of the money even though the law says they are only entitled to actual law enforcement costs related to the particular action; 3) supports an expansion of civil forfeiture to other types of crimes. Terry Curry is a Democrat. I was always led to believe Democrats, more so than Republicans, stand up for civil rights. As a former defense attorney, Curry has to know about the abuses of civil forfeiture and is willing to look the other way. Will any Democratic official stand up and say Curry's position on civil forfeiture is wrong? Given the hsitory of Democrats, especially those locally, that's unlikely. The past couple years, I documented violations of the law at Marion County Jail #2. We implored Democrat Sheriff Frank Anderson to do something about civil liberties violations at the jail, which have led to injuries and deaths. Sheriff Anderson did nothing and wouldn't even investigate deaths at the facility. We contacted Democratic elected officials about problems at the jail. Not a single one expressed any concern over civil liberties abuses and other legal violations. The only receptive audience we received about the jail came from Republican elected officials. At a recent rally, people expressed outrage over the Supreme Court's decision in Barnes v. State that people didn't have the right to reasonably resist a police officer's unlawful entry into their homes. At the rally I stood by a Democratic candidate for office. He said he was shocked that no Democratic elected officials or candidates showed up. Again, it was Libertarians and Republicans who expressed concern over the erosion of civil liberties. Once again, Democrats were nowhere in sight. Have Democrats forgotten that they claim to be concerned about people's civil liberties? It might be a good idea to actually do it sometime. 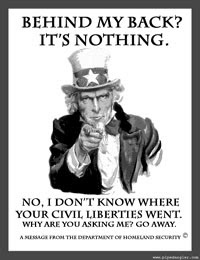 Bart Peterson, Melina Kennedy, and the rest of them never stood up for my civil liberties. Instead they used me as a political pawn. The democrats do not care about real people. In fact, they are not above degrading people if it suits their political ends. The democrats are worse than the republicans because they act like they are above it when they are no better. Once again, we are seeing indications that the two big parties are just different shades of the same corporatist/nanny state politics that are proving ruinous to our civil liberties and our country. As a lifelong Democrat, I hate to see this. It's hard to find candidates to believe in no matter what their label. Democrats and Republicans have different constituencies, and are willing to violate different rights, though there is much intersection. The Democrats on the Supreme Court constituted most of the Kelo v New London majority which ruled that transferring private property from one owner to another can constitute "public use." Democratic party jurists are no less likely to support unconstitutional drug prohibition than Republicans, and to nearly always support abridgements of economic rights in the form of occupational licensing, zoning, and other oppressive regulations. How many Democrats are known for their devotion to the Second, Ninth and Tenth Amendments, or to the rights they ostensibly protect? In the past Democrats were more reliable defenders of free speech, which is mostly why there is still a residue of civil libertarianism connected with the party. But with their support of workplace and campus speech codes, and commercial regulations, Democrats have largely abandoned their claim to be First Amendment defenders. Which party's president was the first to place Americans in concentration camps? I agree with what Nicolas said. The D's are surprisingly willing to take away individual rights and the ones who are against that sort of thing don't speak out. Did you catch Ann Delaney's comments on IWIR about how people shouldn't question the police when they want to enter their homes? I mean she yells up and down about the Patriot Act but somehow thinks that police should just be allowed to run amok!